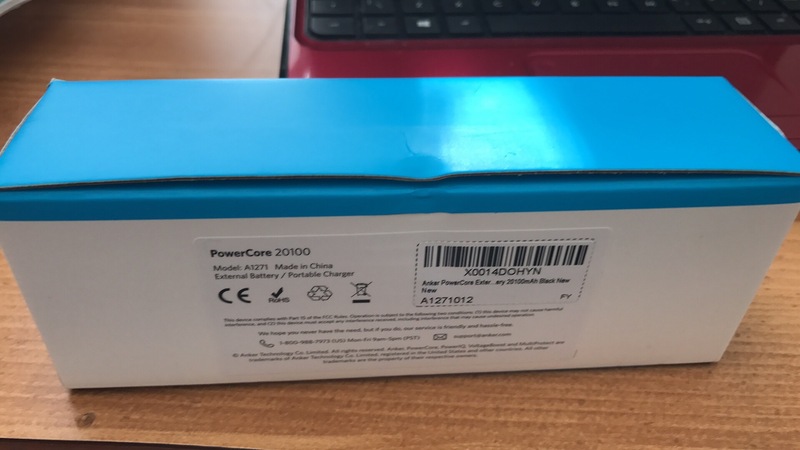 My first purchase yesterday .Considered all reviews about the item before purchase.The positive reviews from others made me choose this particular brand..All seem to be satisfied.I am also fully confident that it will work perfect for me.As "First impression is the last impression", this product will determine my future purchase of Anker products.And..........really charging via this power bank is fast astonishingly. Wonderful speaker. I've been looking for something small and robust which has a good all round sound for mostly indoor use. This speaker lived up to all the positive reviews I had read online prior to buying. So, the product...lovely black speaker, comes with charge cable and nicely presented box packaging. The speaker is nice and weighty (which is a good thing), not over fussy with too many control options (however a "previous song" option would be nice). Pairs up with my iPhone really quick and has an impressive range through walls which I am thrilled about since our house walls don't seem to like wifi reaching upstairs! The sound has wonderful array of capabilities and even has a BassUp option which is great if you should need that extra "punch" - personally I have found its perfect without. Bass is even very clear at low volume which is really nice. I haven't owned the product long enough to weigh in on battery performance but so far so good. Speaking of battery...did you know this speaker doubles up as a Power Bank?! Seriously! I have already used this feature and found it to be a very useful thing to top up my phone battery. Other speaker manufacturers take note! Minus points...pleased to say, very few. As said above, a Previous song option would be good and like some other bluetooth speakers if you could pair two of these beauties up to make a stereo set up, that would be amazing I'm sure! Overall I highly recommend this speaker and would happily have more in the house for other rooms! Thank you Anker for yet another fantastic product! Anker micro USB wires and Astro battery pack. Got the wife a battery pack for Christmas and she told me it's a lame gift, moments later is her favorite. No surprise since she was always low on battery. And the wires are the best. Fast charging and tough as nails. No tangles or kinks just perfect. Got one 3 footer for the car with the quick charge 12v adapter and a one footer in the go bag with the USB charger. I'm wondering if you at altitude with more UV? Altitude 4026 ft (1227 m), Latitude 46.5 deg N, full summer sun with no clouds and no shade. I usually reorient the panel throughout the day. I'm also using both inputs on the PowerCore II, so I'm losing as little as possible in the process. I will get a meter and let you know when I get back home. Generally I agree about the iPhone, and mac products' proprietary and myopic design as time goes on. Add this to the list of reasons I'm close to ditching my mac ecosystem for a more usable set of software/hardware. 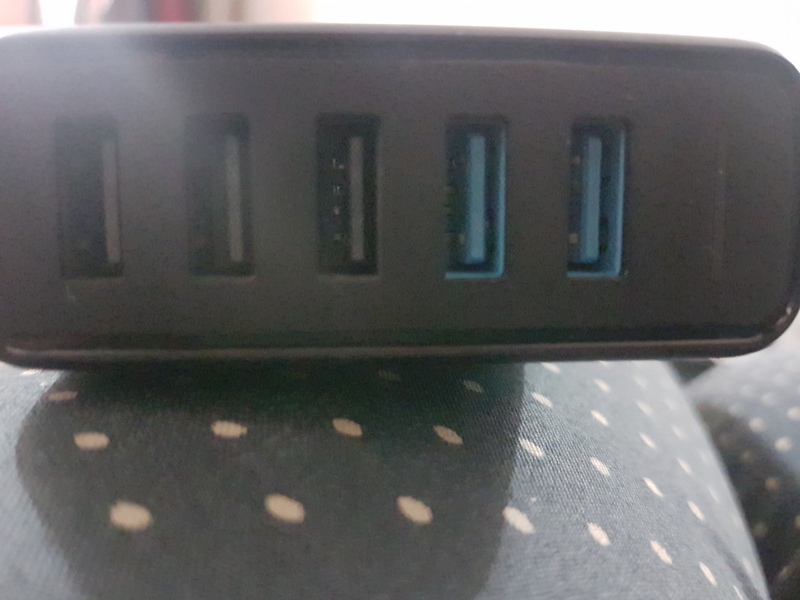 My favorite Anker device is the PowerPort Speed ​​5. 2 x Quick Charge. Model A2054. Is perfect when you want to load multiple devices at once. Has 5 ports. 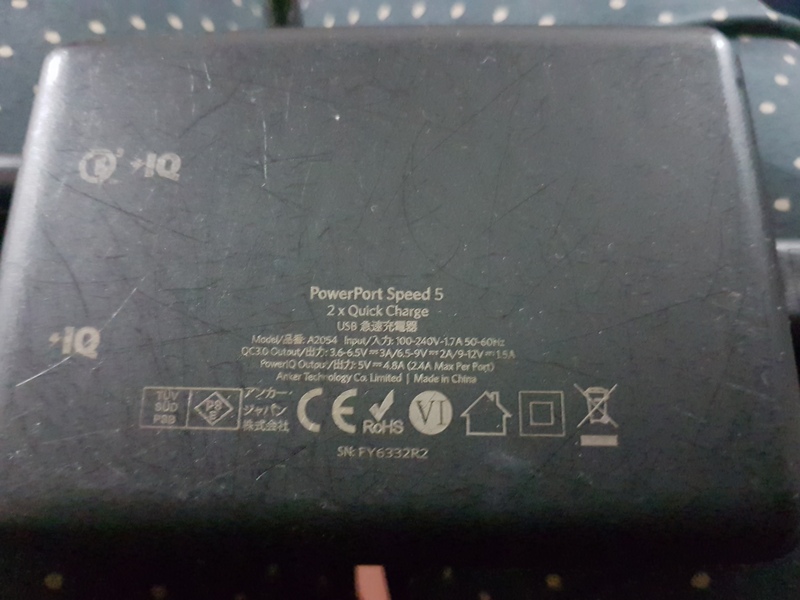 The first two ports are fast chargers. I have always taken with me on each long trip because I always bring with me cameras, cell phones, portable chargers, and as we know, when we are moving from one place to another ... we do not have enough time to wait to have full charge for each device. To start this review I would like to say that I bought this product for Pokémon go and I was really new to the portable charger thing. The package arrived in 2 days with standard free delivery from Amazon which was good as I wanted to get into the whole Pokémon go craze with my friends (I'm 13). When I got the thing out of the box I was pretty impressed by the overall look and feel of the packaging it didn't really matter but just gave the product a more premium impression. The unboxing experience was similar to that of Apple and made it very easy to keep organized and safe is I was ever to return it. When I charged it up fully I got about 2-3 charges out of it using my iPhone SE which was more than enough for a days worth of playing! The slight textured feel of the thing made it pretty easy for me to keep it safely in my jeans and I never fell out...Well apart from when I was tracking this Venesaur and ran to get it until it fell out my jeans and skid across the concrete. I thought I had broken it until I plugged it in and heard that sweet sound (I lost the Venesaur). I stopped playing Pokémon go as the hype died down but I still find use for it in my school life, like earning some mad rep as the powerbank guy in English. Since purchasing this power bank I have purchased many more Anker products and incorporated it into my setup be it USB hubs, or even a cable that can lift a man I can count on Anker to provide me with the absolute best! With the amount of USB gadgets we own, it is always handy to pack a powerbank in your bag for those awkward moments when your device runs out of juice at the most crucial time. I’ve purchased a few of them; from the small Anker Astro E1 5200 mAh powerbank to more expensive powerbanks that house up to 25,000 mAh. So what makes this one any different? Well first of all the size. It measures 12.5 x 6.3 x 1 cm. That’s pretty slim by the way. I have compared the thickness of the PowerCore 5000 and Astro E1. Please take a look at the images provided. The PowerCore 5000 came more than 2/3 charged. There is a 3-step power indicator; 3 lights = 100% or less, 2 = 66% or less and 1 = 33% or less. It looks and feels premium. Holding both your phone and the powerbank in one hand is erm, pretty handy. Reminds me of the power cases that are available for iPhones. I connected various micro USB cables to see the maximum Amps I can get to charge a Samsung Galaxy S5. Whilst the Samsung cable could only manage 1.46 amps on average, my most powerful USB cable (by RavPower) managed 1.92 amps at 5.10v. That’s remarkable and almost the maximum of 2 amps this can pump out. I then tried the ‘little’ Anker cable that came with the PowerCore and…wait for it…it matched the 1.92 amps! The little man means serious business! In fact it matched the maximum all my devices accept. Recharging the PowerCore was a breeze with the included cable, again recharging at 1.95 amps. In conclusion, Anker has developed another masterpiece. Unique in design, the PowerCore 5000 is certainly a contender for my go-to powerbank. I love all my Anker products! My pick for this review is the PowerLine+ USB 3.0 C cable and the Ouick Charge 3.0 Wall Charger. Both of these are high quality and durable. I've used the charger to charge all my USB item needs. It's better than phone factory chargers! I recently bought the cable to charge my new Galaxy S8+ and didn't even bother using the charger/cable in the phone box because I trust Anker products so much. The cable also includes a handy velcro strap to keep your cable from turning into a rats nest with other cables! I highly recommend both products and they are the best on the market! That is a serious magnet. I own a bunch of Anker products, but this one quickly became my favorite. It's small, it is highly functional, it is beautiful, it is made very-very well and did I say it looked good? It does. The Universal Magnetic Mount consists of two pieces, er, 3 kind of. A large round magnet, and a steel ball attached to small cone shaped base. The round magnet piece fits right over the steel ball and that's it, you've assembled your mount. The cone shaped base has a sticky on the bottom for sticking it to the final mounting place you've chosen, and the rest is done using some pretty powerful magnetism. Seriously though, this magnet is super strong. Steel plates are also included and either put those in phone's case on the back, or stick them to your bare phone. You are now living in style. Magnetic phone holders are the greatest thing since sliced bread and this is the best phone holder by far. You can swivel the phone around with ease on the ball the magnet sticks to and the magnet keeps your phone on there for whatever the road can dish. I haven't had my phone drop once since I've had it and I've hit bumps, knocked it on accident, more bumps and it stays every time. I never knew I could feel this way about a phone mount, but here are. Oh, and it's only like 15 bucks. I spent 30 on another kind and it doesn't even compare. Also, it's so pretty and that magnet is so strong. I'm getting more and sticking my phones and tablets everywhere. Shoot, I think it may be strong enough to hold my kids. The Anker powerdrive speed 2 reached and exceeded my expectations! The package arrived securely well within the expected delivery date and the Anker packaging is very clean and neat and draws you in as a product user. The car charger itself is very robust and feels strong and well built when held in your hands. When plugged in both ports can be used to achieve maximum power output and efficiency. As always with Anker I am very happy with this product!! Second test began with one full minute of the solar panel sitting in the sun without the iPhone(y) plugged in, followed by five minutes of charging directly with an apple cable. I saw 4% increase in battery. I will update my video review. That's a really good thing to know about iPhone - I had no idea. Nothing too fancy for me, but I love all of my Anker products, my portable charger, car charger, PowerPort 2 Elite, IPhone screen protector, and PowerCore Case. I rely on them heavily to keep me charged and pumped through my day. I love them so much and I'm just happy to have the opportunity to be apart of the Anker family. to all the people I've met over the years.